Two major U.S. homebuilders will report quarterly earnings in the wake of a weak fourth quarter for the housing market. HONG KONG - Jan. 8, 2019 - PRLog -- Lennar and KB Home are each set to report quarterly results Wednesday, giving some of the first hints of the direction of the housing industry heading into 2019. Wall Street expects Lennar to post fourth-quarter 2018 adjusted earnings of $2.03 per share on revenue of $6.53 billion, as well as quarterly orders of 11,300, according to data. Lennar in its previous earnings release lowered its guidance for deliveries, orders and earnings for the fiscal fourth quarter, at the time citing rising mortgage rates and higher home prices that cut affordability. KB Home is expected to report earnings of 93 cents per share on revenue of $1.33 billion and also provided dimmer guidance on similar concerns. The SPDR S&P Homebuilders exchange-traded fund has underperformed the S&P 500 over the past year, declining about 27% versus an about 6.2% decline in the broader market. In December, homebuilder sentiment declined to the lowest level in about three years, with the National Association of Home Builders/Wells Fargo Housing Market Index dropping to 56 from 60. But new-home construction rebounded in December and permits – which predict future homebuilding – rose more than expected. However, homebuilders – a component of the borrowing cost-sensitive housing industry – may be set to rally given the Federal Reserve's more dovish tilt as of late, Trinity analyst Alex Chua wrote in a note earlier this week. He upgraded Lennar and peer construction companies PulteGroup, Masco and Gibraltar Industries to Overweight from Sector Weight. A less hawkish Federal Reserve could lead to a stock market rally in the first half of 2019, with homebuilders poised to be cyclical outperformers, he noted. And homebuilders are currently trading at an attractive valuation of about seven times 2019 estimated earnings, he added. 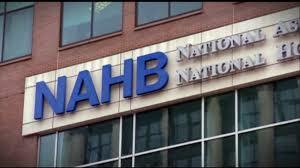 On Wednesday, the Mortgage Bankers Association will release the results of its weekly mortgage loan application index. The index declined by 8.5% for the week ending December 28 for the third consecutive week of declines, following a 1.44% decrease for the week prior. Other major corporate earnings slated for release Wednesday include Bed Bath & Beyond and Constellation Brands. Bed Bath & Beyond is expected to deliver adjusted earnings of 18 cents per share on revenue of $3.03 billion. Shares of home goods store declined about 49% in 2018. Constellation Brands, whose beer portfolio includes Corona and Modelo Especial, is expected to deliver earnings of $2.06 per share on revenue of $1.91 billion. Shares of Constellation brands were lower by 30% in 2018. The Federal Reserve will release the minutes of its latest meeting from December, during which members announced the fourth rate hike of 2018 and raised the benchmark interest rate by 25 basis points to 2.25% to 2.5%. The minutes, published at 2 p.m. ET Wednesday, will provide further details into the rationale behind the voting members' latest monetary policy decision, as well as their outlook on future moves. A parade of Fed officials will deliver speeches on Wednesday. Raphael Bostic, the president of the Federal Reserve Bank of Atlanta and one of the Fed's more dovish policymakers, will deliver a speech in Chattanooga, Tennessee. Bostic, a non-voting member this year in the Federal Open Market Committee (FOMC), said earlier this week that he only saw one rate hike for 2019. Voting FOMC members Charles Evans of the Chicago Federal Reserve and Eric Rosengren of the Boston Federal Reserve will also each deliver speeches Wednesday. To find out more information on the opportunities Trinity Investments Limited see's within the US markets in 2019, contact us today at info@trinity-investments.com or visit our website http://www.trinity-investments.com to find out more about their services and products available.